I would like to start off by saying I'm NOT vegan, I say this just because when I've offered these to people they've responded "vegan sweets? ewww no" without even trying them! They're missing out big time as these are some of the tastiest jelly sweets I've had in a while. Another thing I like is I often find normal jelly sweet mess with my IBS and I get dreadful abdominal cramps, these jellies however don't cause me any pains whatsoever so there's an added bonus for me. 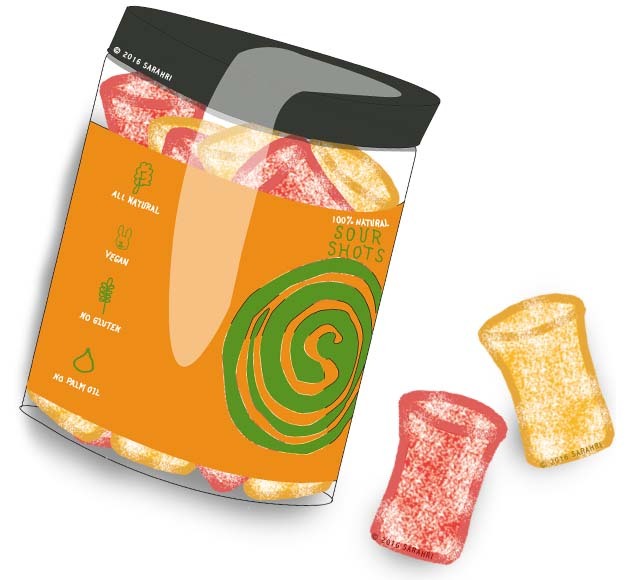 In this little tub of sour goodness are peach and strawberry flavoured jellies covered in sour sugar loveliness. They're 100% naturally flavoured using real, proper fruit juices which makes them taste even better, like they don't taste synthetic or chemically, if you get what I mean? What else makes these jellies fabulous? Well they're suitable for a lot of people, they're free from gelatine and gluten, they don't include palm oil and are suitable for vegans. They are now my new favourite jelly sweet and I can't wait to get more. I got mine from Ethical Superstore but I'm sure you can get them from the SugarSin website too for about £3.50. Hope you enjoyed this review post, have you tried these sour jellies before? Remember you can keep up to date with my blog via bloglovin!